Locally grown food may be today’s current trend, but it is here to stay. The health benefits of organic produce are unquestionably greater than mass-produced chemically enhanced corporate food. More stores are looking for locally produced vegetables and proteins to sell, and more shoppers are looking for healthier alternatives for their diets. Despite these trends, sales of locally grown organic food are lagging in traditional low-income urban markets, due to factors including high prices, lack of access to quality product and unfamiliarity with the benefits of organic produce. In addition, those in low-income situations who rely on meal programs and hunger centers for food have little to no access to a steady supply of fresh-grown vegetables for their daily diet. Community Greenhouse Partners has already built six hoop houses and a hardshell greenhouse. 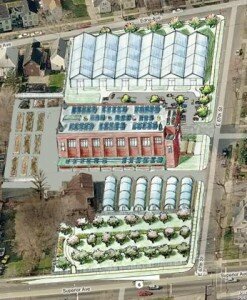 Aquaponic systems will go online this summer as we continue to grow on the grounds of a former Catholic Parish in the heart of downtown Cleveland. We’ll not only hire locally, but grow and sell locally-grown organic vegetables at low cost to urban families and teach sustainability and earth science to young people.